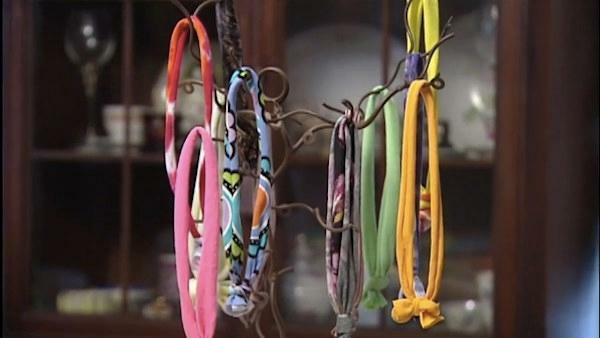 Make your own adorable hair ties and headbands from old t-shirts! Julie Bartos, owner of c.Hair.i.Tee, shows how to make these upcycled hair accessories. You want to pick a shirt that has a little stretch, but not too much. Also, make sure there's color on both sides if that's important to you! Spread the t-shirt out on a smooth surface and cut off the bottom seam and the sides. Get as close to the edge as possible. Choose how big you want the headband to be. Julie makes them in three sizes - 2, 3 or 4 to 6 inches. Use scissors or a rolling cutter to cut a long strip in whatever width you chose. Take one and tie a knot at the end and you've got your headband! For the bigger ones you can taper the ends to make it easier to tie the knot. For ponytail holders, the directions are the same, but use a material that has a little more stretch, like a workout top. You want to cut them in one inch strips and knot. Depending on the size of the shirt and thickness of your hair, you can get twice as many! To learn more about Julie Bartos and her company c.Hair.i.Tee, visit Charitee.org. All proceeds from sales go to charity!